Teen leaders are at the core of your program. I love this time of year. Students are heading back to school and the start of a new Teen Science Café season is on the horizon. This is the time of year for adult leaders to connect with those organizations and individuals who are already serving teens to let them know about your program. 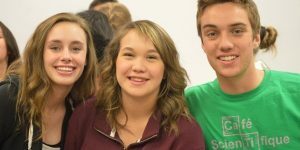 Science, robotics, engineering, and math teachers at the local schools, teen librarians, adults leading scouting, and 4-H programs are all great contacts to help you recruit teen leaders and to promote the Café program; these connections can be maintained throughout the school year. 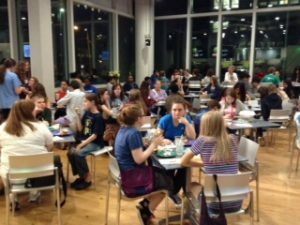 Teen science cafés are a proven model for engaging youth in exploring science, technology, engineering, and math careers. 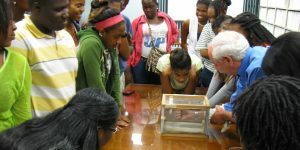 Evidence shows that teens come to realize how STEM impacts most everything in their lives, better understand the nature of science, and develop both social and cognitive skills that allow them to consider multiple perspectives before making up their mind on issues in the news. This awareness is critical for teens to become informed citizens. Each year, I like to make a visit to the Science Department head at our local high schools for a reminder about the program and to seek permission to visit science classes to make a short pitch to the students to get involved in the Teen Science Café program and perhaps become a leader. I circulate a paper and ask those interested to provide their contact information. This works beautifully, especially in freshman and sophomore classes, as these students are often looking for new experiences. It takes only 5 or so minutes and you can have names of 5-15 teens interested in hearing more about the program and, for some, becoming a leader. We schedule a meet-up of the new and experienced leaders a couple of weeks before our first café. We have typically already recruited the speaker based on ideas the teens gave us in the prior season. Having a low key, get-to-know-you event at the beginning with the teen leaders really helps them bond. A bit later in September, we have a full day training of our leaders. We work on effective marketing, learning to properly do an opening and a closing ceremony, staff the food table, staff the welcome table, and interact with the speaker and newcomers to the program. Other teens are interested in multi-media and want to be the photographers or videographers documenting the café events. Getting tips on great interview questions and practicing these skills with their peers helps them gain confidence for interviewing scientists. We use some of the bios and essays from our past cafés (see cafenm.org/archive.html) to learn to generate questions for an interview. For the writers in the group, they can learn how to write a short article for the local newspaper and can share the story of the café with the Teen Science Café Network members by submitting a Cool Café report with images. There are always teens in the group who are social leaders. They make great ambassadors at the welcome table and love to lead icebreaker games with their peers. As an adult leader, you can help your teens discover and hone new leadership skills. This year, we are having a one-day joint meeting of 8 different teen science cafes in New Mexico. The model of teen science cafés originated in New Mexico, after we learned about adult science cafés and Junior Science Cafés that originated in the United Kingdom. By bringing all of our sites together in New Mexico, we hope to gain new ideas from the different sites and also hope to inspire our teen leaders when they realize they are part of a much bigger national program. We have New Brochures! Let us know if you would like some to share with your colleagues, potential Café partners or other organizations that might be good candidates to start their own Teen Science Café program. Check it out!